Every Thursday, I publish a post containing photo(s) taken from above or below, and invite you to join in the challenge by posting your own photos with an up or down perspective. 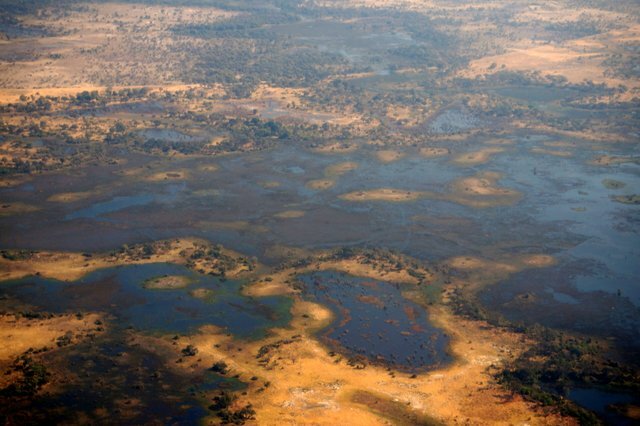 This week, I’ve chosen to look down in Botswana. 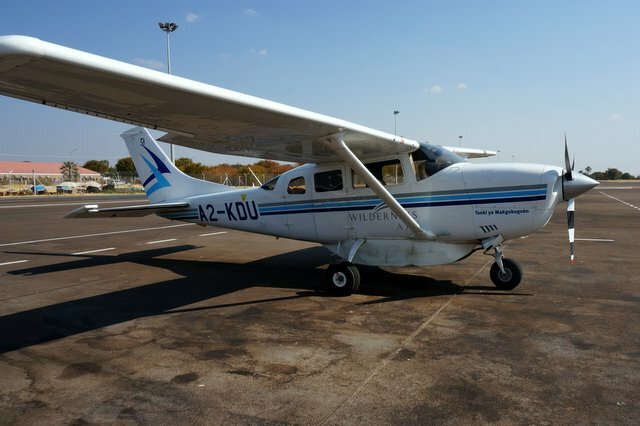 I’ll admit I was a little nervous at taking such a tiny plane for our flight from Maun into the Okavango Delta. 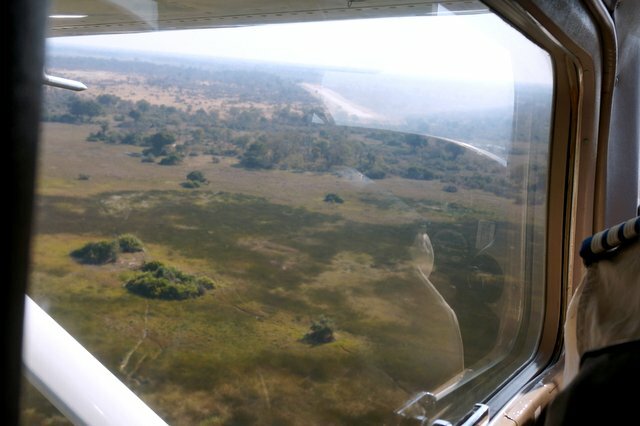 But the flight and service were top class, and flying low gives incredible views; any nervousness was soon forgotten. 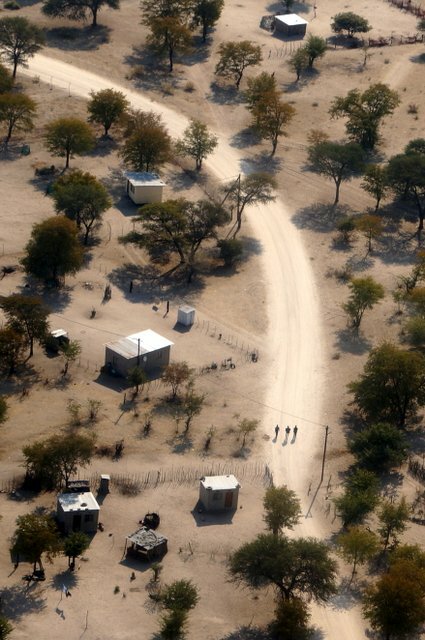 As we left Maun the road below seemed to tell us to go further, and seeing the dusty track was a keen reminder that if you want to explore afar in Africa you really need to fly. Soon the water of the Delta was beneath us. This was our trusty steed. Happy Exploring was had by all! Welcome to week 26! A big thank you to all who entered last week. You can see all of the entries from previous weeks on my Pinterest board if you are seeking inspiration, or are just plain nosy. So please show us what you have; share your up or down perspective with us. Simply create your own post as normal, create a link to this challenge and then click here to enter your link and to view other entries. If you have any difficulties with the linky, please just leave your link in a comment below and I will upload your thumbnail. Finally, please don’t forget to go and visit the other challengers and pass on your views and encouragement. Linked to Favourite Photo Friday, Outdoor Wednesday and Photo Friday. I did two this week!! ENJOY! Hurrah! The more the merrier. Simple photos can be so intriguing – thanks for including these Cee. Great photos. You need to be in a little plane to be able to feel the connection below but it is a little nerve wracking. I have a really small looking down this week! Love these photos and only further whetted my appetite for our trip to Botwsana…all being well. I don’t know, I love your lighthouse shots. And all your chilled Florida posts, and slightly sickly Key Lime Pie posts, made me more than a tad jealous! Aw, thanks 😉 That reminds me – where are your Florida posts?? I was too busy while I was there and only landed at Gatwick this morning… yawn! I was sorry to leave. I LOVE that first shot. It really gives the flavor of the country. The second one is really cool too. I’ve flown in that kind of plane and smaller… both my dad and brother were/are pilots. I know what you mean about being a little apprehensive. What awesome down shots this week! Were you not tempted to be a pilot too? Pingback: Look Up, Look Down: Insects Below!